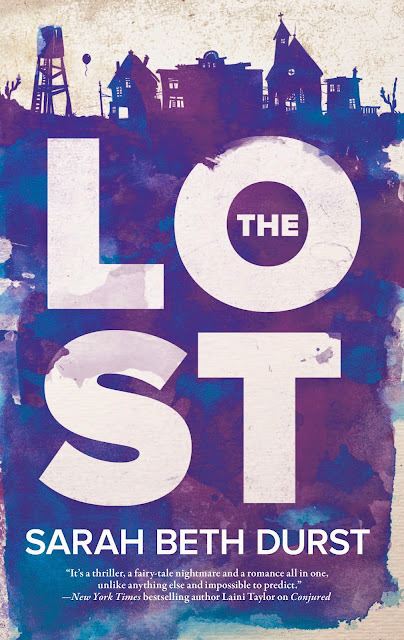 The Lost has been my most surprising read of 2014 so far. The story was not at all what I was expecting from the synopsis. In fact, I almost put the book down after a few pages. I don’t read anything sad that has someone suffering from cancer. But, by the time I had read that, I had already fallen in the love with Durst’s writing style. There were multiple times that the main character’s inner thoughts made me laugh out loud. And I connected completely Lauren from the beginning. It was one of the few books that I’ve read that the writing itself could have made me read the entire book, not the plot, not the characters, not the mystery. Just the writing. Good thing that the plot, mystery and characters were also spectacular. The world of The Lost was both, at once, incredibly imagined and incredibly real. It was like if Sarah Dessen and Neil Gaiman had a love child book, this would be it. There’s a slightly dark, creepy story behind this lost town and its Finder and Missing Man. But there’s also a story of self-discovery and coming to terms with loss. I loved the mystery of the town and Lauren. What did Lauren lose? Her belief, her courage, her determination? What is the connection between Lauren and the Missing Man (I have a theory there)? Who is Peter? Why is he drawn to Lauren? Why is Claire attached to that knife? There were a few things that I didn’t like, but there none of them were enough to detract from my enjoyment of The Lost. There were a few things at the beginning of the novel that seemed a little scary movie cliché. The end also had too many loose ends. I had a lot of theories about the Missing Man and Lauren, and I stayed up late in the night to see if I was right. Well, I didn’t find out. I’m hoping that’s in the sequel. Also, I want more Claire in the sequel so I hope that the ending of book one is not the last that we see of her. Lauren was a little too stubborn. The people of the town kept telling her that she could leave if she found what she lost. However, she kept trying to find an easy way out. The way out was to find what she lost, and she should have looked for it a lot sooner. I’m ecstatic that I kept reading The Lost because it was so great, and now I’ve found a new author that has a backlist that I can obsess over. I can’t wait for the second one to come out (supposedly later this year! ), but before that, I’m starting on the other novels that Durst has published. You made me want to run to the bookstore to buy this book! You should....I loved it! Thanks for stopping by! Great review. I have this on my TBR list, and now I want to read it even more!